Once upon a time there only used to be a few mattress companies and even fewer that you could rely on to make quality products. It was a simpler time. Today, there’s almost no end to mattress manufacturers and new ones pop up seemingly every day of the week. However, one thing has remained the same – some are clearly better than others, there’s no doubt about that. But what do you do when you can’t pick between two brands that are both good? Well, you compare them and see which one comes out on top! In this article two great mattress companies will be pitted against each other until one wins – it’s Leesa vs. Tuft and Needle! If you don’t know much about these two brands, it’s time you found out a bit more – I’ll tell you a bit about how they both got started and where they are now. Leesa is a relative newcomer to the market, being founded only three years ago in 2015. However, it has quickly risen to the top of the industry and is now considered one of the best mattress brands around. The company produces mattresses which aim to fit any type of sleeper while being sturdy and easy to afford. This is what made them so successful, so quickly. They are a completely USA-based company and manufacture their mattresses in the country. They are also committed to charity and donate one mattress for every ten that they sell. Founded in 2012, Tuft and Needle started selling their mattress a year later and achieved almost immediate success. Their mattresses were well-designed and affordable leading to them running over their competition. They were also one of the first online retailers in the mattress industry. Since then they started offering a lot of other products, including other mattresses, bedding, furniture and more. Recently they also partnered with Amazon, opening plenty of new retail locations, further expanding their business. If you’re looking for the quick low-down on the two brands, I’ve made this handy chart of Leesa vs. Tuft and Needle that you can check out and get a good idea of what the two brands are about. If you’re looking for more info, though, keep on reading. Now, I’ll go more in-depth about the specifics of each mattress, comparing them each in five different categories – construction, comfort, firmness and feel, customer service and pricing. 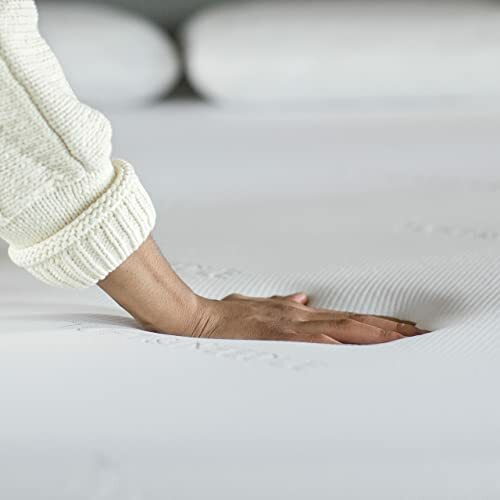 The inner workings of the mattress, the materials it is made of, and the way they’re all put together is instrumental to how the mattress performs. If you don’t know what it’s made out of, you shouldn’t be buying it. Here’s a comparison of the meat and bones of these two mattresses. Mattresses manufactured by Leesa are a total of 10 inches thick, more than average and something that clearly contributes to the quality of the mattress. However, what makes this mattress special is clear only when you look at the individual layers and the three type of foam that they’re made of. The first layer is two inches thick, and it’s probably the most important one. It’s made out of a special, proprietary type of foam that no one except Leesa uses – Avena foam. This material is quite similar to latex foam and offers the mattress a few unique qualities. It is more affordable than latex foam, but it is almost equally stretchy, durable and breathable, making this mattress incredibly comfortable. The second layer is made to offer supreme pressure relief and support, making this mattress great for people who sleep on their back. It is two inches thick and made out of memory foam. It works in concert with the first layer since the Avena foam offsets the usual hotness of memory foam. The third layer is the foundation of the mattress, and it’s a total of six inches thick. It’s made out of dense support foam, giving the mattress a strong foundation and the thickness needed to last for years to come. There’s also the mattress cover, which shouldn’t be looked over. The Leesa cover is made out of one single piece of fabric that’s durable and tough. It is soft, breathable and comfortable as well since it’s made out of lycra, the material used for sports clothing. Overall, the Leesa mattress offers amazing quality and uses three different types of foam which accentuates their strength while minimizing their downsides. The use of their patented type of foam also makes the product more affordable than it otherwise would be. Unlike most other mattresses on the market these days, the Tuft and Needle mattress is not a hybrid mattress. It uses a two-piece construction and a custom type of foam for the top layer. The mattress is also a total of ten inches thick, just like the competing product. The second layer is made out of seven inches of support foam. It’s also a type of polyurethane foam but with a density of only 1.8 PFC, unlike the top layer. It offers decent support and a good foundation, but it does almost nothing else. The cover of the mattress is simple but effective. It is completely white, and it is made to be thin and stretchy with focus on breathability above all else. It’s reasonably comfortable but you shouldn’t expect it to last for too long. Overall, the focus of this mattress is on breathability and support more than anything else. Additionally, it’s made to be as affordable as possible without compromising on the overall idea of a breathable and supportive mattress. The materials used and the way they’re put together reflect that. The best mattresses are comfortable for almost everybody, but that doesn’t mean they will necessarily be better for you. Here, I’ll compare these two mattresses in terms of their feel, sinkage, breathability, motion transfer and more. The buoyancy of this mattress is relatively high which, combined with the properties of the Avena foam, helps keep you cool when you sleep. This mattress is more breathable than average because of it and if you have trouble with sweating or feeling hot when you sleep you’ll like sleeping on this baby. The motion transfer reduction of this mattress is also better than average. If you happen to sleep with a partner who’s restless, or you are the one who is restless, you won’t need to worry too much about tossing and turning or getting up during the night. The edge support it offers is quite poor though, so don’t sleep near the edge. You do sink in a lot into the mattress which is comfortable to some people, but won’t be so great for others. Back sleepers will enjoy this mattress the most, due to how it sinks and the great pressure relief that it can offer to your tortured spine. It is also quite great for heavier people in general. This is an extremely buoyant mattress, making it great at cooling you down when you’re ‘sleeping hot’ but it doesn’t exactly rival the cooling properties of its competitor here. It’s good but not great in this regard. It’s also not that good at reducing motion transfer, so you will have to be more careful when getting up during the night so as not to wake up your partner. However, there is one area where this mattress excels, and that is edge support. Due to how firm it is, you can sleep safely near the edge or use it for sitting down; it’s not a problem whatsoever. It also sinks less when you lie down on it, making it great for people who sleep on their side. It doesn’t have good pressure relief though, so back sleepers should avoid it. Heavier people will also have a tougher time sleeping on it, and it will feel too hard for them. Different people look for mattresses of different firmness, and it’s important to know how a mattress feels in that regard. It also impact the supportiveness of the mattress and, depending on which position you prefer to sleep in; it can make or break a mattress for you. Here, I compare these two mattresses in terms of firmness and supportiveness. The firmness of the Leesa mattress would be somewhere around 6 on a scale where 1 is the softest and 10 is the firmest mattress you could imagine. If you were to classify it, it would be a medium-firm mattress, though less firm than some others who would fall into the same category. This is quite a supportive mattress, especially for people sleeping on their backs. It offers great pressure relief due to the materials used to make it. It is also quite good for supporting heavier sleepers so you will like it if you’re over 200 pounds. You do sink into it a lot even if you’re a lighter person, though. This may be beneficial to some, but not everyone likes to be enveloped by their mattress, so it’s up to you if you see this is a bonus or a negative. The T&N mattress falls into the medium-firm category as well, but it is a bit firmer, scoring a solid 7 on the firmness scale. It’s not incredibly supportive though and if you’re a heavier sleeper, it won’t be too good for you and will feel too hard as well. This mattress doesn’t sink in too much, not more than ½ or a full inch on average, making it great for people who don’t like to sink deep into their mattress. It’s also what makes it ideal for people who sleep on their side. However, if you like to sink into your mattress, you won’t be too fond of it. Even if a company has the best product you can imagine, you wouldn’t want to buy from them if they take five weeks to deliver it and it comes in damaged with no warranty. If you want to know what kind of delivery, warranty and customer service these two brands offer, here’s a comparison of Leesa vs. Tuft and Needle. This company offers some already standard trial and warranty options for their customers. You can try out a mattress for 100 days, and during that trial period, you can return it, free of charge. You also get a 10-year warranty. If you happen to return your mattress from Alaska or Hawaii, though, you’ll have to pay 100 dollars. They give all returned mattresses to charity or recycling. Their delivery service usually takes between 5 and 10 days to get the mattress to you, and they offer no installation service. They do deliver everywhere in the USA without charging a fee, even Alaska, and Hawaii. This extends to Canada and the UK as well. Their customer service team is good, and they tend to respond to questions quite promptly, so you can readily ask them about anything. This company does deliver to the entire USA, including Alaska and Hawaii. However, while the delivery is usually free, it will cost between 120 and 190 dollars for those two states – not a great look. They deliver to Canada at a price as well, except Quebec. Delivery usually takes between 2 and 10 work days. You can return the mattress within the first 100 days, as is standard, and you get a 10-year warranty as well. Returning the mattress from Alaska and Hawaii costs money though. Also, if you order from Canada, you do not get the 100-day trial period. The customer service team they have is responsive enough, and they’ll answer any questions you may have in a timely manner. When directly comparing prices between the two companies according to the prices on their websites, the Tuft and Needle mattresses are up to almost 500 dollars cheaper than Leesa mattresses. Some of the smaller sizes are almost equal in price but the difference shows when it comes to Queen, King and California King sizes. If you’re buying a larger mattress and you want to save some money, it’s clear which brand is the winner. Both companies offer constant additional deals and discounts from time to time, but I think it’s clear to see which company has the more affordable prices. However, that does reflect on the quality of the product so buyer beware. As you can see in the Leesa vs. Tuft and Needle comparison, these two mattress brands offer quite different experiences to their customers and which one you like more is up to you. If you sleep on your back and you weigh a bit more than average, you’ll pick Leesa, if you sleep on your side and you want to save a bit of money you’ll probably pick Tuft and Needle. For me, Leesa seems to be the superior brand here in most regards except a few, but you’ll have to make the final decision for yourself. You’re the only one that knows what kind of mattress fits you the best. I hope I helped you make your decision and until next time I hope you have a good night’s sleep on your new mattress.